Ten Grapes to Know - Description | W. W. Norton & Company Ltd.
It’s true! These 10 wine grapes will take you from casual dinners to fine dining. Pinot Grigio, Sauvignon Blanc, Chardonnay, Viognier, Pinot Noir, Sangiovese, Syrah, Merlot, Cabernet Sauvignon and Zinfandel make the cut. 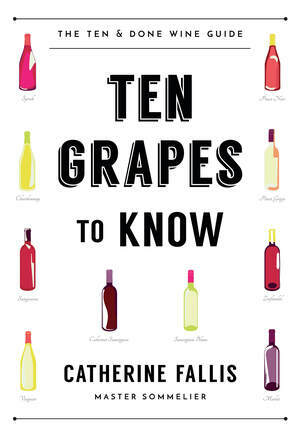 The book covers the basics of tasting (and why wines taste the way they do), buying and pairing wine. Fallis gives readers tricks to remember the difference between the côtes of Burgundy, offers dozens of specific recommendations in every price range, provides tips for talking to sommeliers and shares memorable tasting exercises. This book will help readers build their wine confidence whether they’re looking for an inexpensive bottle for dinner at home or trying to impress the in- laws.